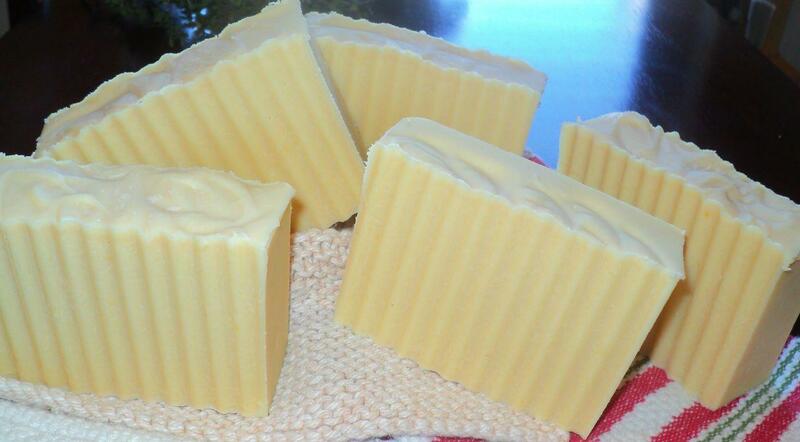 So here it goes...my first attempt at giving some simple instructions on how to make a basic cool method milk soap. And when I say basic...I mean basic! There are only 4 ingredients but you must have a few other supplies on hand as well. If soap making is going to become something you do often - which once you realize you can do it - it will likely become something you won't want to do without. So with this in mind, I'd recommend investing in some simple soap making equipment..some you may have on hand already. With your plastic container on your scale, measure out the coconut oil (you can heat the coconut oil in the microwave to a liquid consistency or scoop it out and melt it in the stock pot on the stove - your choice). Add your coconut oil to the stock pot. Measure out the olive oil and add to stock pot. If you've melted the coconut oil on the stove - remove your pot from the heat before adding the olive oil. You do not want this oil mixture too hot. In most soap making you regulate the temps but I've cut out the thermometer and temp taking with these simple instructions. So just be sure you bring the coconut oil to the melting point and then remove from the heat source before adding your olive oil. This is a cool method milk soap - so your 9oz of milk must be frozen. In your stainless steel bowl add your frozen milk and then add the lye on top of the milk (lye can be dangerous so be careful - all the books and any place that talks about lye recommends using gloves and goggles when handling..this is up to you..but stir your mixture being careful not to splash it on your skin - if you get it on your hands, wash immediately with soap and water. Use your judgement). Stir your lye and milk mixture with a long handled spoon (slotted works the best) until the lye has melted the milk and the lye has dissolved. The bowl should be cool to the touch from the outside by now (the milk mixture may be a bit grainy but if you're using a stick blender to mix the milk/lye/oil mixture, it will resolve that issue). As the lye dissolves and your frozen milk turns to liquid form, you may also smell a bit of an ammonia smell - this is from the lye and is normal. Open a window or turn on your exhaust fan if the fumes are too much. Once your lye/milk mixture is ready, place your sieve on your stock pot and pour the lye/milk mixture through the sieve and stick blend. As you're stick blending, you will see the soap begin to form as the liquid turns to a creamy consistency and the oils start to pull away from the side. Now you can add your fragrance or essential oil if you'd like - or you can leave it unscented. Your choice. Depending on the fragrance oils, it may accelerate the consistency of your soap faster. If you've purchased your fragrance oil from a soap making site - it will or should say in the description of the oil, if it accelerates the trace or not. Just something to watch out for - we've all had soap set up in the pot. So if it happens and you have to scoop it out of the pot into your molds - not all is lost it's just a pain. You're looking for a pourable consistency though. Once you add the fragrance oil, blend thoroughly and pour immediately into your molds. This mixture will still be caustic from the lye - so use caution not to get it on your skin. 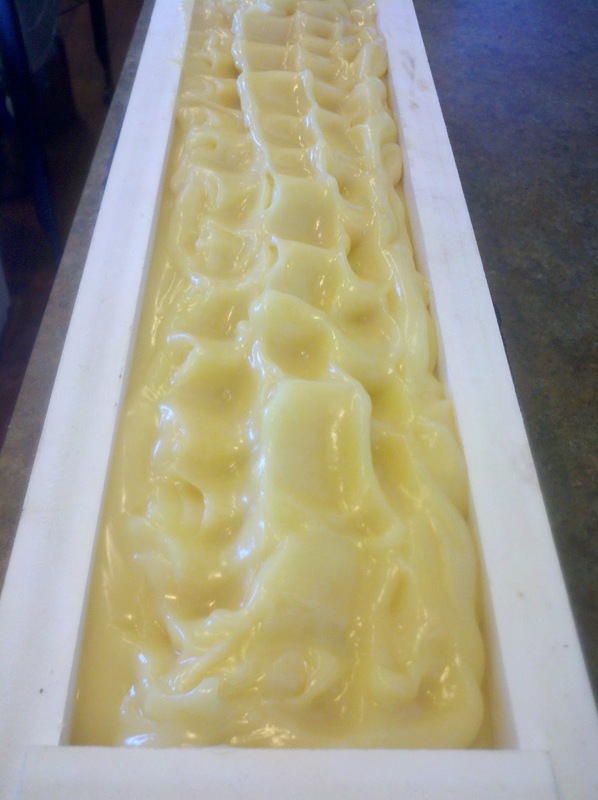 Your soap will harden and can be removed from the molds in 24-48 hrs. If you've used a box type mold, you can cut them now using a pizza cutter or knife. Move your soaps to a place where they can cure for a few weeks - low humidity and out of sunlight is best. Wallah. You've got milk soaps! There are ph strips you can use to test your soaps before using..the choice is yours. Letting it cure will lower the ph, so the longer it cures the milder the soap.